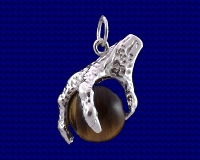 Pack of 5 Craftsman made Sterling silver Eagle's Talon with Tigerseye sphere charms. Approx. size mm x mm.